Hot on the heels of On the Production of Monsters comes the next production in our 2012 Lawler Studio Season, “The Golden Dragon”:. This surreal story of fate, love, loneliness and immigration by acclaimed German playwright Roland Schimmelpfennig is set mostly within a Chinese/Thai/Vietnamese restaurant called, not surprisingly, The Golden Dragon. In the cramped kitchen, a rotten tooth is wrenched from the mouth of a young boy, and as it flies through the air and lands in a bowl of Thai soup, the stories of the local residents bubble to the surface. This week we filmed a short teaser video for the show, right here at MTC. 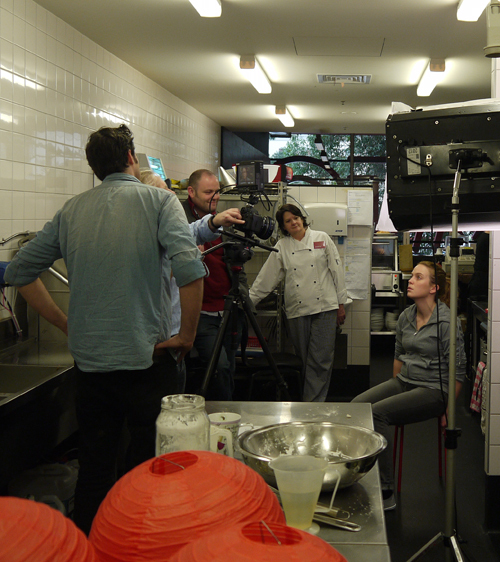 Our lovely HQ Cafe team were kind enough to let us invade the kitchen for the morning to grab some footage. Here you can see Dana Miltins (far right) preparing for the scene, with our videographer Sunny (far left), his assistant Andrew (manning the camera), Director Daniel Clarke, and our Catering Manager Andrea looking on. In the meantime, you can learn more about Dragon’_s Set and Costume Designer, Andrew Bailey (he of _Monsters pop-up set fame), in this interview from Dumbo Feather magazine. “The Golden Dragon”: by Roland Schimmelpfennig is playing at the MTC Theatre, Lawler Studio from 20 June to 7 July.